Gryphons are more fierce than Dragons, more majestic than Unicorns and is revered by civilizations throughout time as a superior beast to be honored. They are the guardians of hidden treasure, gold mines, precious stones and nests its fortunes. Their hoards over their lifetime would be brimming with sparkling, shining pieces of precious metals and gems. To find a Gryphon hoard was to become instantly wealthy for life. Gryphons are highly in tune with the Astral & Spiritual Realms using their ability to portal to their advantage. They scour at all times any avenue to take which will lead to rewards and blessings. Gryphons were consecrated to the Sun; and ancient painters represented the chariot of the Sun as drawn by Gryphons. The Gryphon inhabits the Scythia steppes that reaches from modern Ukraine to central Asia; gold and precious stones are abundant; and when strangers approach to gather the stones, the creatures leap on them and tear them to pieces. Gryphons are unique creatures who enjoy human company as they have always held humans with affection. This connection to humans is thought to be why they are favored to be used in heraldry. They are highly divine creatures that are extremely loyal in many ways. They mate for life and when their partner dies they never look for another mate. They have been adored, admired and loved by civilizations for centuries over many, many countries including Egypt, England, France, Germany and many more. As spirit companions they are protective, nurturing, loving and loyal. They will lead you to paths of opportunity for prosperity, wealth, empowerment and self-evolution. They will help you to amass your own riches in your life; of all kinds. They go after any profitable opportunity with savage fervor. They feel an eternal and personal bond with you as they are exceedingly loyal companions. When you invite a Gryphon into your home they make a deep and meaningful connection to you for a lifetime. 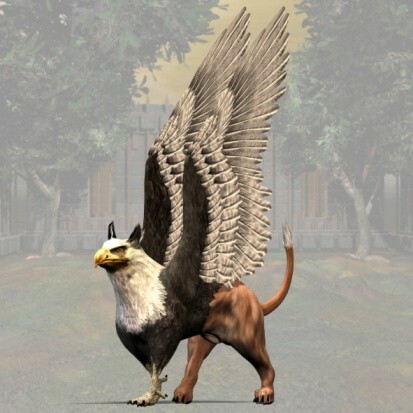 This Gryphon spirit's name is Thebben (Theh-ben). She is 1,464 years, she has a grey hide with black feathers. She is quick to align you with prosperity, good luck, and happiness in all endeavors of your journey. She is a good friend who listens and pays close attention to details. She offers you the vision and power you need to realize your potential in all situations, and take greater control within your own matters of personal goals and pleasure. She communicates well through visions and telepathy.